At dawn Christ calls out to them from the shore. They do not recognise him. He tells them to cast their nets on the right. There is a miraculous catch of 153 fish. Peter hastens to Christ. He confirms his love for Jesus. Jesus gives his commission to Peter: feed my lambs; tend my sheep; feed my sheep. This makes us recall John 10: the Parable of the Good Shepherd; "I am the Door"; and "I am the Good Shepherd"
Christ commands Peter: "Feed my sheep"
Finally in John 21, there is a foretelling of Peter's death in old age, and a comment about John's future. 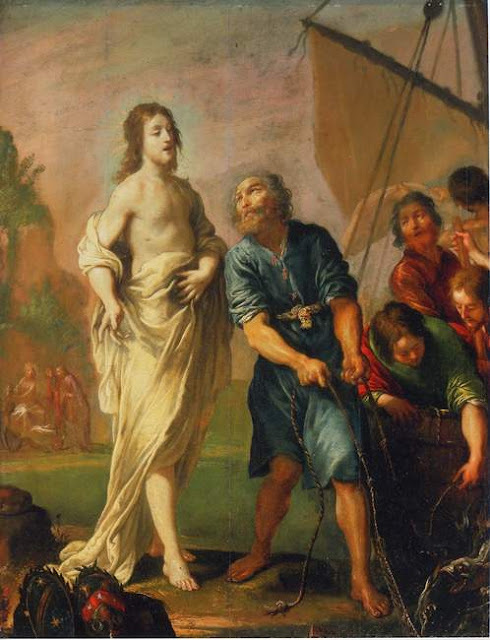 Vignon`s painting is not that of the young vigorous Peter who denied Peter before the Crucifixion. This is an old Peter well after the Resurrection and the Pentecost. This is the old shepherd. How many trials and tribulations had he been through since that meeting on the Sea of Tiberias. In late May Pope Francis reflected and meditated on John 21 in his address to the Italian Episcopate. "This evening this Altar of the Confessio thus becomes for us the Sea of Tiberias, on whose shores we listen once again to the marvellous conversation between Jesus and Peter with the question addressed to the Apostle, but which must also resonate in our own hearts, as Bishops. “Do you love me?”. “Are you my friend?” (cf. Jn 21, 15ff.). The One who scrutinizes hearts (cf. Rom 8:27), makes himself a beggar of love and questions us on the one truly essential issue, a premise and condition for feeding his sheep, his lambs, his Church. May every ministry be based on this intimacy with the Lord; living from him is the measure of our ecclesial service which is expressed in the readiness to obey, to humble ourselves, as we heard in the Letter to the Philippians, and for the total gift of self (cf. 2:6-11). Not that this should be taken for granted: even the greatest love, in fact, when it is not constantly nourished, weakens and fades away. 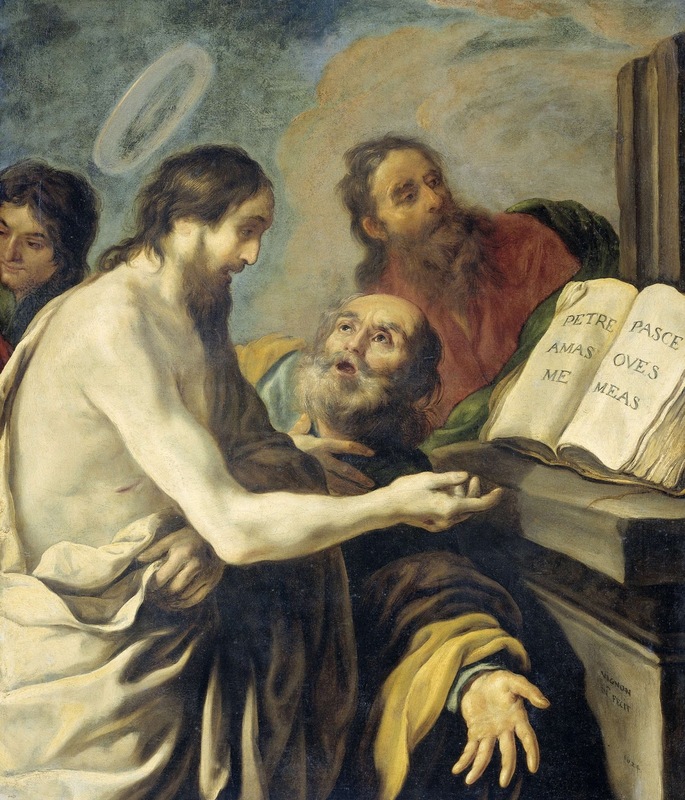 Not for nothing did the Apostle Paul recommend: “take heed to yourselves and to all the flock, in which the Holy Spirit has made you guardians, to feed the church of the Lord which he obtained with his own Son's blood” (cf. Acts 20:28). Peter, purified in the crucible of forgiveness could say humbly, “Lord, you know everything; you know that I love you” (Jn 21:17). I am sure that we can all say this with heartfelt feeling. 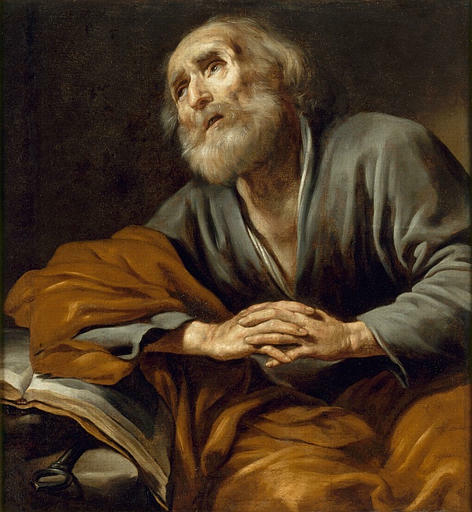 And Peter, purified, urges us in his First Letter to tend “the flock of God... not by constraint but willingly, not for shameful gain but eagerly, not as domineering over those in your charge but being examples to the flock” (1 Pet 5:2-3). Yes, being Pastors means believing every day in the grace and strength that come to us from the Lord despite our weakness, and wholly assuming the responsibility for walking before the flock, relieved of the burdens that obstruct healthy apostolic promptness, hesitant leadership, so as to make our voice recognizable both to those who have embraced the faith and to those who “are not [yet] of this fold” (Jn 10:16). We are called to make our own the dream of God, whose house knows no exclusion of people or peoples, as Isaiah prophetically foretold in the First Reading (cf. Is 2:2-5). For this reason being Pastors also means being prepared to walk among and behind the flock; being capable of listening to the silent tale of those who are suffering and of sustaining the steps of those who fear they may not make it; attentive to raising, to reassuring and to instilling hope. Our faith emerges strengthened from sharing with the lowly. Let us therefore set aside every form of arrogance, to bend down to all whom the Lord has entrusted to our care. Among them let us keep a special, very special, place for our priests. Especially for them may our heart, our hand and our door stay open in every circumstance. They are the first faithful that we bishops have: our priests. Let us love them! Let us love them with all our heart! They are our sons and our brothers! Dear brothers, the profession of faith we are now renewing together is not a formal act. Rather, it means renewing our response to the “Follow me” with which John’s Gospel ends (21:19). It leads to living our life in accordance with God’s plan, committing our whole self to the Lord Jesus. The discernment that knows and takes on the thoughts, expectations and needs of the people of our time stems from this."